On Tuesday 24th October 2017, several comrades tried to enter an empty house to make it their home, but the property was equipped with an alarm system. All the comrades managed to flee except one, who was arrested and detained. The cops launched a burglary investigation, even though the house was unoccupied and the owners themselves later acknowledged that nothing had been taken. The arrested comrade, Alfidel, doesn’t have papers and has no way of proving his identity. He was given an immediate trial at the TGI de Créteil and sentenced straight away to one year in prison for burglary without stolen items, and is currently imprisoned in Fresnes pending appeal. The imprisonment of Alfidel is the latest chapter of his turbulent life, in which he has had to constantly struggle against oppression by successive authorities. Born in Chad in the 80s, whilst still a minor he took part in a rebellion against the dictator Idriss Déby. Severely wounded and only partially treated for this (he still suffers the effects of his injuries), he was imprisoned until groups seized control of the capital, N’Djaména, and opened the prison gates. He escaped to Libya, but the civil war there and the fall of Gaddafi forced him to flee again, particularly since black people have been severely persecuted for their perceived collaboration with the Libyan dictator (in fact, Idriss Déby had sent troops from Chad to support his mate). Arriving in Europe via Italy, Alfidel ended up in France. He claimed asylum but was refused, as is the case for the majority of asylum seekers in France: in 2016, 71 % of claims were refused at first instance, 62 % on appeal (source: OFPRA). Everyone refused becomes sans-papiers (without papers). Chad is a country where being a political opponent puts you at risk of being killed, but as Deby is a staunch ally of France, it’s not classed as a dangerous country. France uses Chad as a base to consolidate power in the region and send various “peace keeping” missions in neighbouring countries. In return, France supplies arms, training and and military power when Deby’s regime becomes vulnerable, as it did with previous governments. In the contexts of talks about ‘hot spots’ (centres for the detention and sorting of migrants) in Niger and Chad, Marcon recently reaffirmed that Chad is a safe country. Meanwhile, the attacks of Boko Haram only reinforces the perceived legitimacy of France’s regional presence in the eyes of the UN. A significant number of ‘certified’ refugees never receive any accommodation to which they are legally entitled, and those seeking asylum almost never do. Refused asylum seekers find themselves without solution. In this way Alfidel found himself squatting along with other Chadians of various legal statuses, as well as students, unemployed and precarious people that made up the ‘Francs-Tireurs’ collective in La Courneuve and the ‘Maison Rouge’ in Saint-Denis. Our comrade, foreigner, without papers, and with almost no resources, finds himself in an extremely fragile situation. He is particularly exposed to this classist, racist ‘justice’ of the state that convicts black people, the poor, the homeless and other minorities all the time. Alfidel was faced with an eminent figure of this justice, Hoc Pheng Chhay, of the tribunal of Créteil, who after giving his lecture, sends defendants to prison without bothering to hear their lawyers speak. This particularly harsh judge has a habit of giving custodial sentences for trivial offences, so much so that even prison directors have been complaining. Whilst in custody, Alfidel was also given a OQTF (Obligation de Quitter le Territoire Français – an order to leave France) and a ban on return for a year. In general, OQTFs can be challenged within 15 to 30 days, but in this case he was only given 48 hours to appeal. This tiny window in which to appeal makes it impossible in practice to challenge, and Alfidel’s case was rejected. For our comrade it was a double sentence, the order to leave France limiting the hope of any release before his appeal hearing. The repression hit our comrade Alfidel, but it also strikes severely at all those who respond to their material misery through organisation and solidarity. Material, legal, financial and moral support for our comrade is necessary. A collective has come together and will propose various initiatives and discussions with those who experience the same repressive violence of the cops, the law and prison. A solidarity dinner will take place on 9th December from 12h at the Cantine des Pyrénées (77 rue de la Mare in the 20th arrondissement of Paris) to collect money for Alfidel and for legal fees. At 14h the collective will meet to discuss the next steps, particularly relating to the appeal. 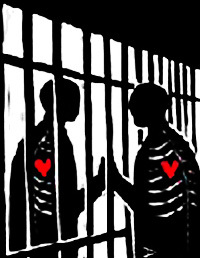 Donations will be sent each month to Alfidel in prison by Kalimero, the solidarity fund for prisoners of social war. Free Alfidel and all the others! No papers for anyone and palaces for all!